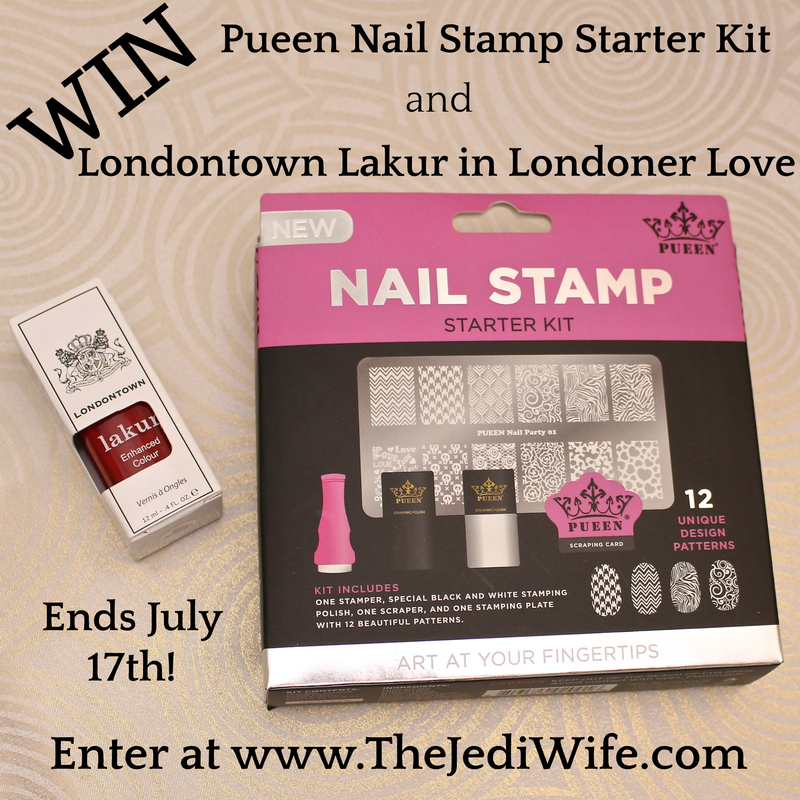 Stamped Nail Art Design with Pueen and Londontown plus a Giveaway! Happy Monday, dear readers! I hope you enjoyed your weekend! As for me, I'm currently in Las Vegas for Cosmoprof North America and am looking forward to sharing my finds with you once I return home. Until then, I thought I would share my latest nail art design. Let's check it out! I know, I got a little ahead of myself since I am so excited about the final look, but I would never forgive myself if I didn't take a moment to share the most amazingly gorgeous red cream nail polish that I have been obsessing over. 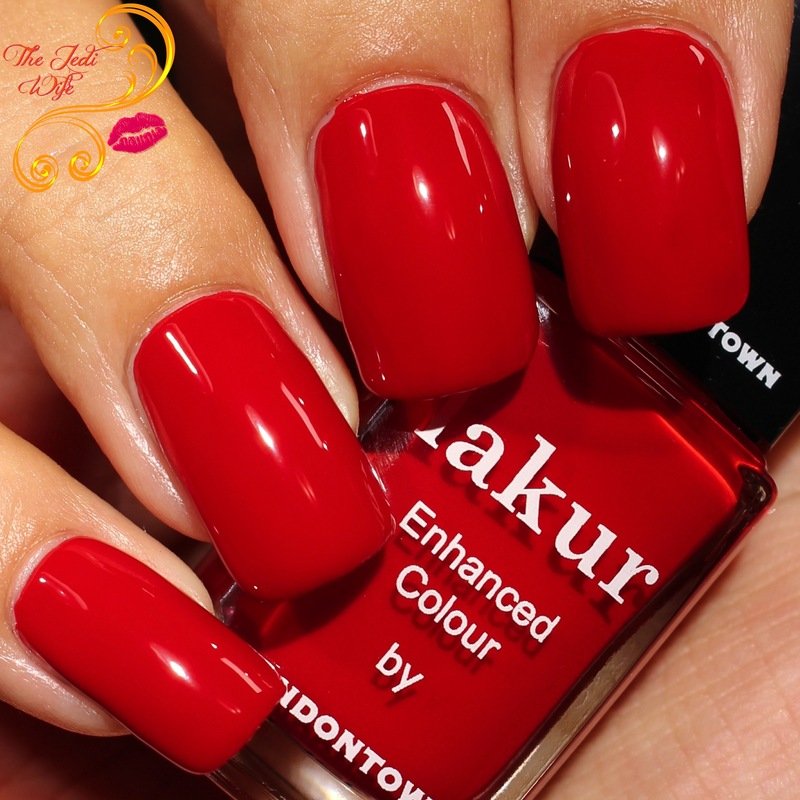 Londontown is actually one of the brands here in Las Vegas, and while I was perusing my stash recently to do some nail art, this fabulous red captured my attention. Named Londoner Love, this polish boasts an ultra-smooth and creamy formula that I am smitten with. Just two quick coats and my nails are dazzling. Oh! And these photos were taken before I added top coat! Now this is one shiny beauty! How pretty is this red polish?!? I actually felt a little bad about having to add to it for some nail art since it is exquisite on its own, but I already had a design in mind to try out. 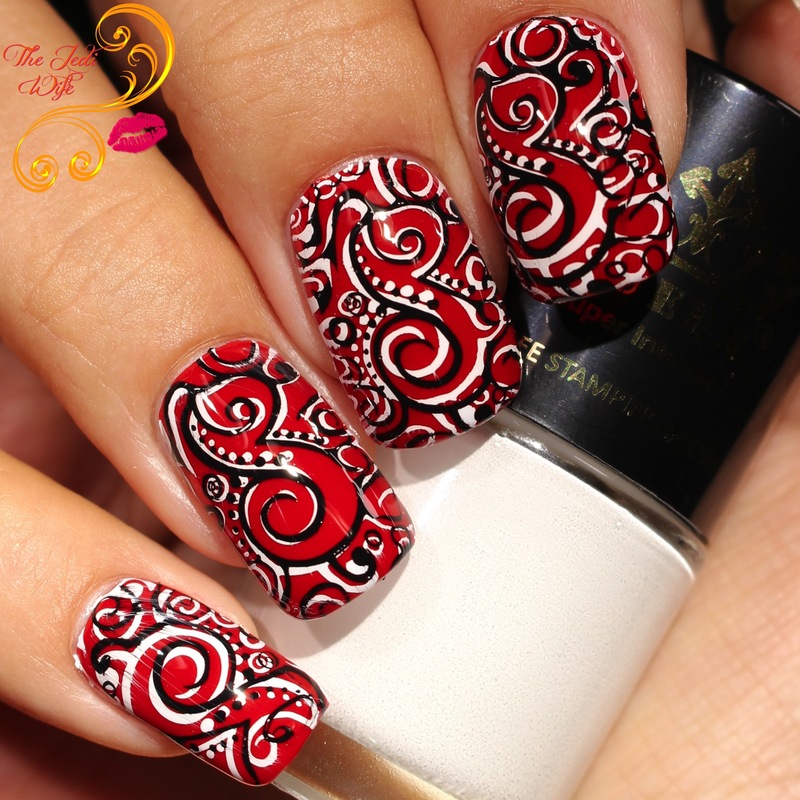 Red, black, and white is one of my favorite colour combinations, and I don't believe I've ever used them together in a nail art design before. I've been waiting for the perfect opportunity to break out my new Pueen stamping starter kit that I picked up at my Walmart, and after sitting for probably a month, I'm glad to give it some love! The white and black stamping polishes are part of the Pueen stamping kit, and I was really impressed with both the polish quality and the image I tested on the plate. The only downside I experienced with this set is the bristles of the black polish are horribly messed up, and that did make getting the polish onto the plate a little trickier in addition to not making a huge mess returning the brush into the bottle. I used the included Pueen stamper to stamp the white polish but then switched to one of my clear-backed stampers to help me place the black stamping images shifted away from the white. I don't know what it is about double stamping like this that I am so drawn towards, but I love the effect it creates! While I might have been a little apprehensive about partially obscuring Londoner Love, I really love the final look of this manicure! 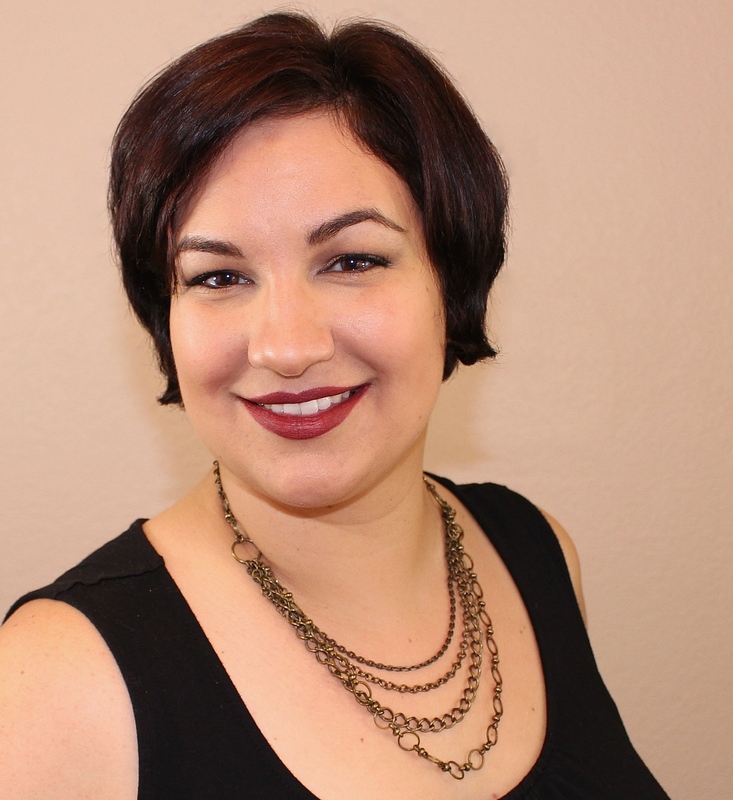 And now for a little giveaway for my beloved readers! I've talked about this Pueen stamping kit with several people, and I was surprised to discover it isn't readily available in a lot of Walmart stores. I guess stores are only getting a few boxes and they are selling quickly, but since mine had a second starter kit, I picked one up to giveaway. Also, because I love Londontown's Londoner Love so much, I wanted to include that too (a new bottle, I promise!) 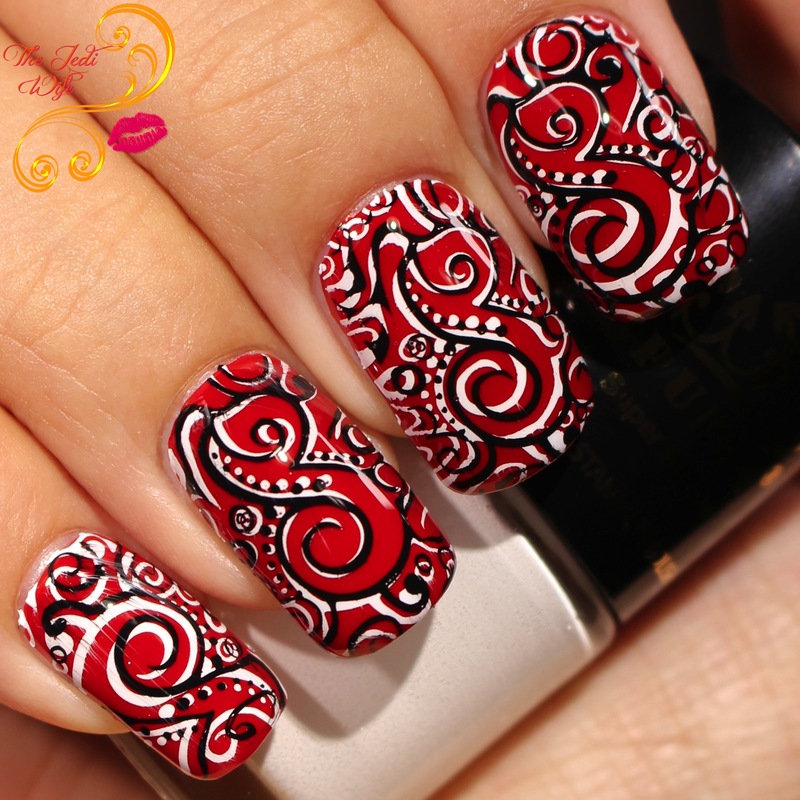 so you could create your own red, black, and white nail art looks too! To win this set, enter the rafflecopter widget below. I love the nail art you did! <3 I tried to enter the giveaway but it keeps giving me an error. Ugh, Rafflecopter is acting screwy. I'm hoping it is fixed soon since this is a quick giveaway! Oh man! I love what you did with this. Can't go wrong with that color combo. How fun! I tried to find this kit in stores without much luck. Thanks for offering a fun giveaway! Awesome giveaway! Your manicure is stunning. I can't find this set at Walmart and I've checked two. More double stamping! It's been a favorite of mine! Drag marbling. Not many do it. Your stamping skills are legit, I love it! Honesty I love seeing all sorts of manicures and nail arts! Maybe creating something very fall inspired -- with greens and oranges and burnt reds! I may pick up that kit just for the polishes - looks like they stamp well! I love the nail art you did! That red is absolutely gorgeous. Great job on the stamping here, it looks great! That base shade is luscious and I agree about the red-white-black combo - it is always chic! Oh wow, I love the nail art you did! I've never tried stamping. Looks fun! I really love that red polish too! I've never tried stamping before. Your nails look great though, so I'm definitely going to have to try it. With summer here, I would like to see some neon manicures. I have neon polish but don't know how to make them pop or good color combinations. Thanks for the great giveaway! I'm a huge fan a mix/match nails, so maybe a look with a few different nail art techniques!